In July 1713, a cessation of hostilities was sought from the indigenous populations of the coast of Maine and New Hampshire. 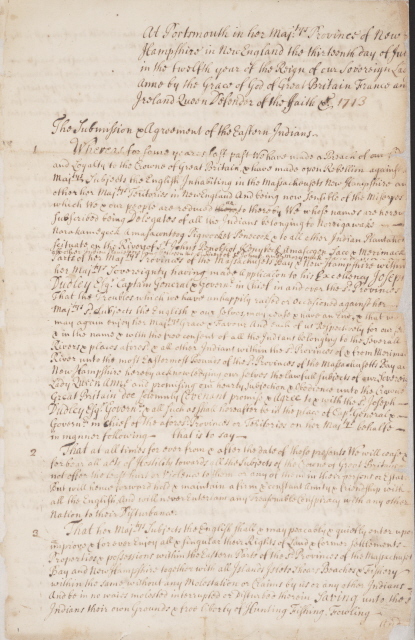 Members of those communities -- described in the document as the "Eastern tribes" -- were brought to Portsmouth; and after three days, signed a document now called the 1713 Treaty of Portsmouth. That at all times forever, from and after the date of these presents, we will cease and forebear all acts of hostility toward all the subjects of the Crown of Great Britain, and not to offer the least hurt or violence to them or any of them in their persons or estates, but will honor, forward, hold, and maintain a firm and constant amity and friendship with all the English, and will not entertain any treasonable conspiracy with any other nation to their disturbance. This image is an authorized reproduction of the copy of the Treaty now in the Levi Woodbury Papers Collection at the US Library of Congress. See Treaty of Portsmouth, page tw0.